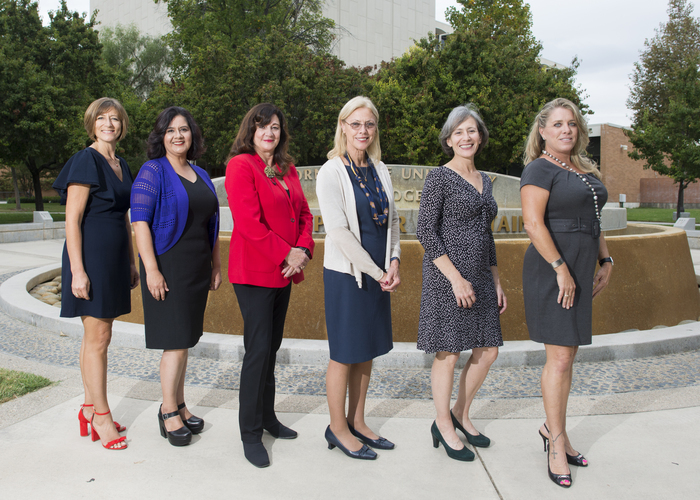 From left to right: Monica Multer; Wendy Lozano; Shari Tarver-Behring, interim dean of the Michael D. Eisner College of Education; CSUN President Dianne F. Harrison; Joyann Sofio; and Chrsitina Bludau. Not pictured: Madeleine Walker. Photo submitted by Vanessa Villavicencio. The Los Angeles Unified School District (LAUSD) recently honored five California State University, Northridge alumni as 2018 Teachers of the Year. Christina Bludau (from Sherman Oaks Elementary), Wendy Lucia Lozano (from Canoga Park Elementary), Monica Multer (from Melvin Avenue Elementary School), Joyann Sofio (from Walter Reed Middle School) and Madeleine Walker (from Palisades Charter Elementary School) were all recognized at the LAUSD Teacher of the Year Luncheon in July. CSUN’s Michael D. Eisner College of Education is one of the largest public colleges of education in California and routinely produces teachers who are recognized as being at the top of their field. Each 2018 Teacher of the Year shared how CSUN played a part in their commitment to education. Monica Multer ’02 M.A. (Educational Administration), ’02 (Cred. ), said CSUN provided the guidance, information, and support to meet the daily challenges of being a teacher. “I was given realistic expectations while challenged to think in a way that I had not thought of prior to attending [CSUN],” Multer said. The journey to teaching is one that didn’t come without hard work for Joyann Sofio ’08 M.A. (Educational Administration), ’08 (Cred. ), who despite having a teaching credential and experience, still needed to take other courses to earn a California credential. Wendy Lozano ’07 M.A. (Early Childhood Education), ’08 (Cred. ), was inspired to become a teacher during her undergraduate studies at the University of California, Irvine. Lozano initially went to college to study law but learned that a good education punctuated by dedicated teachers and protective school environments was the best deterrent to keep youth out of the juvenile justice system. She decided to teach instead. “Teaching gives me the opportunity to stop the ‘school to prison pipeline’ by empowering students to improve their academics and to believe in themselves through good teaching practices, meaningful interactions and modeling a growth mindset,” Lozano said. 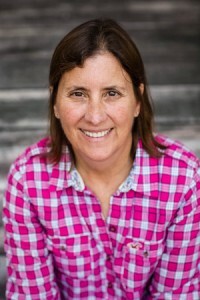 Madeleine Walker ’84 (Liberal Studies), ’85 (Cred. ), ’92 M.A. (Personalizing Elementary Education) knew she wanted to be a teacher ever since finding inspiration through her fourth-grade teacher Donna Archambeau. “She took the time to get to know every one of her students. I have always hoped that I would impact children in the same positive manner that she affected me,” said Walker. Walker believes that students’ interest is the most powerful thing to drive instruction. No two teachers share the same journey, but what they do have in common are the rewarding memories that come with teaching. “Working with these students, who were mostly from underprivileged families, made me realize the difference teachers can make on a child, having belief in them, taking the time with answering questions, or simply listening to a concern they might have, made a difference in their future education,” said Bludau. Lozano finds joy in seeing her past students maintain resiliency during hard times. “My favorite teaching memory is every time an old student who is struggling with adversity in their life returns to visit me and tells me they are still motivated to go to college or a trade school,” she said. When asked for advice for any aspiring teachers, these former Matadors had some encouraging words. “I would tell a new teacher to hang in there, ask for help, and celebrate the successes no matter how small,” said Multer. Walker said it’s important for new teachers to show compassion and get to know your students so that lessons can be developed in ways to meet educational, social and emotional needs.